This vehicle is very well known in Alfa Romeo and rally circles and presents a rare opportunity to purchase a classic car to rally, race or add to your collection. Built to FIA long distance rally regulations with CAMS log book, the vehicle has been extensively strengthened and seam welded. The car is powered by a 2 litre 105 series engine, 4.56 LSD rear axle, custom brake hydraulics, MCA shocks with remote canisters, uprated suspension, custom long distance fuel tank, and CAMS/FIA compliant roll cage. The vehicle has had a recent suspension and brake overhaul and paint refurbishment. It has been fastidiously maintained and prepped for each rally and is ready to compete now, or to enjoy as a classic collectable, that will only continue to appreciate in value. The owner is rationalising his extensive Alfa collection and is reluctantly parting with one of his favourites. It's 5pm and getting dark quickly, parking the car and gathering camera gear, I cant help notice the roller door of Avanti Spares wide open, a garage bathed in light. Owner and creator of Avanti Spares, Richard Anderson, works away, doing some last minute polishing. The photo shoot tonight is his 1970 Alfa Romeo Giulia Super Rally Car, which he has owned and raced for around 25 years. Like all Alfa Giulia's, they have a simple yet aggressive stance, Richard's rally version however, is more so. 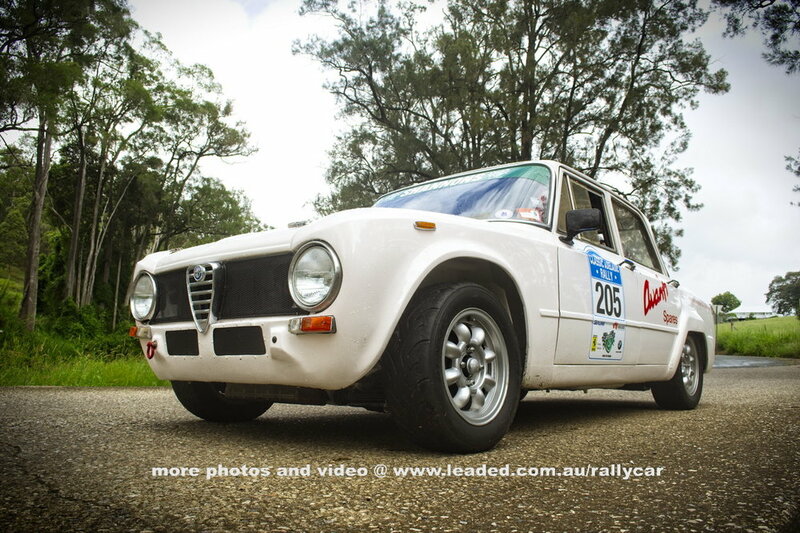 With the cars widened fenders, extended wheel arches and smatterings of rally'esk war paint such as Classic Adelaide, Tow stickers and Avanti signage, this little Alfa “is” the business! Once entering Avanti Spares, your hit visually with everything Alfa. Richard started Avanti Spares back in 1982, an Alfa purist, Richard's keen eye and years of experience (Richard started playing with Alfa's in the 70's) has allowed him to follow his passion in both working and racing the Italian marque. Pride and place in the centre of the workshop the Giulia gleams from the photo shoot rig lights, this car has quite the history and while standing looking at the car, its as if the car wants to tell your a story... The story just has to be told. “When the late Nick Britten announced the London to Sydney marathon, it had to be an Alfa” Richard says, with a glint in his eye. Although at the time he had no idea what model to run, he knew it had to be an Alfa. After much thought and deliberation assessing the various 105 models, the weapon of choice chosen was the Giulia Super for its 4 doors and lightweight construction. The rules at the time allowed for a larger engine, so Richard and his team prepared the car during 1991 and 1992 in time for the 1993 event. Richard was attracted to the event by the fact that Service Crews were not allowed, and the opportunity to compete with some of the worlds finest rally drivers. 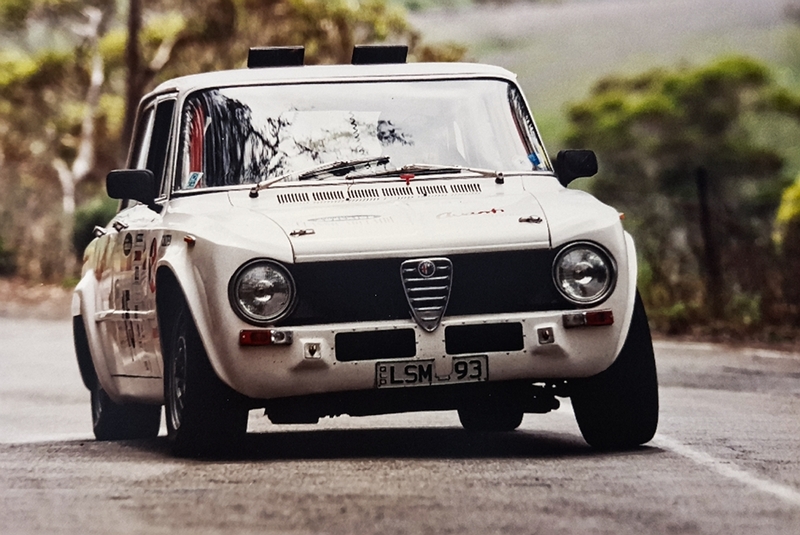 The Giulia Super was out gunned in terms of speed, but more than made up for it in reliability and strength, especially in the Australian stages. There were a few niggles here and there, but in the end the Giulia had proved itself, holding its own with all of the field in the more difficult stages that Australia had to offer. Finishing 11th outright, with qualifying even as high as 7th along the way, Richard says the only reason for the occasional niggle was due to driver and pit crew fatigue, the incredibly late nights endured, and the resulting occasional mistake is made. Richard was no stranger to this event, as he had competed previously in an Alfetta. So the Guilia was entered quite quickly only a short time after the London to Sydney Marathon. Papuan Safari roads were quite brutal and ground clearance came through more important than raw horsepower. Again the Giulia Super performed superbly, scoring Richard and his team a win, beating Murray Coote (a four time winner of the event) and previous Australian Rally champion. Enjoying a good thing, Richard entered again the following year, and again won the event againstmuch faster cars. Richard puts all this down to reliability and strength, a common denominator fromthe London to Sydney effort. Although not the driver of the event, Richard had friends and colleagues campaign the car in the first 4 years, 1997 through to 2000. If the 4 years of Classic Adelaide were not enough for the Giulia Super, Richard teamed up with local Holden Dealer Keith Callan, after Richard had received an invitation to the 2000 London to Sydney event. However due to a few off the track moments, event placing did not fair as well as the rally of 1993. “We did have a lot offun!” says Richard, which goes to show what driving an Alfa is really all about. With a plethora of International competition under its belt, the Giulia Super now enjoys less taxing, but still competitive events such as local gravel rally stages. Just recently, as early as 2015, the Super Giulia has again romped around the hills of Adelaide. Under the reigns of Cameron Wearing, the Guilia Super won outright in the “Early Classic” category. “Something we weren’t really expecting” says Richard. From the outset the car was built to comply with the FIA endurance rules, and now has an extensive CAMS log book as well as a raft of enhancements (see Guilia Super Specs side bar, right). With Richards fastidious and skilled hand, the Guilia Super has now become a fine collectable that can at a moments notice, still enjoy competition. Or sit idle like a heroic soldier with many stories of battles past. Owned (25 years), prepared and rallied by a well-known enthusiast and Life Member of the Alfa Romeo Owners Club. 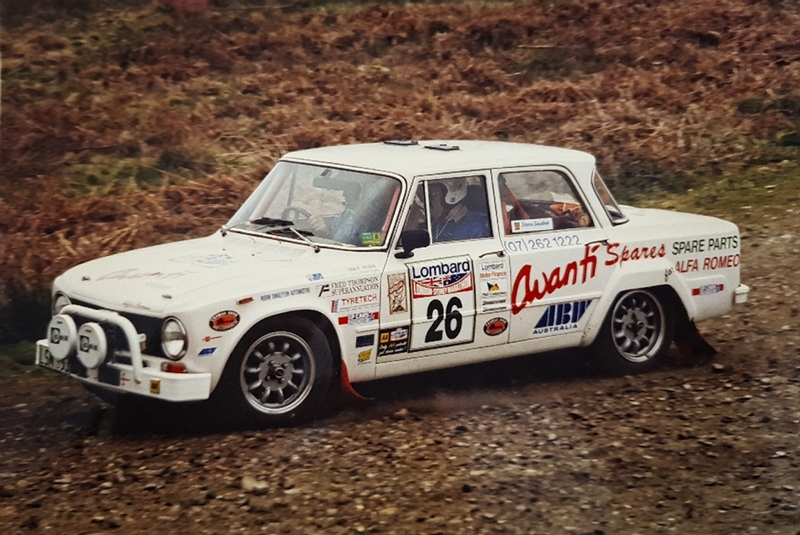 This vehicle is very well known in Alfa Romeo and rally circles and presents a rare opportunity to purchase a classic car to rally, race or add to your collection. strengthened and seam welded. The car is powered by a 2 litre 105 series engine, 4.56 LSD rear axle, custom brake hydraulics, MCA shocks with remote canisters, uprated suspension, custom fuel tank, and CAMS compliant roll cage. The vehicle has had a recent suspension and brake overhaul and paint refurbishment. It has been fastidiously maintained and prepared for each rally and is ready to compete now, or to enjoy as a classic collectable, that will only continue to appreciate in value.